Sierra Blanca is a small town in Hudspeth County about 90 miles southeast of El Paso, TX and only 16 miles north of the Mexico border. There are about 900 residents, 60% of whom are mostly Hispanic. 30% of the roughly 430 housing units are vacant. Sierra Blanca is an extremely poor town where almost a third of the households live below the poverty level of $15,000. The town’s per capita income is about $10,500 but the entire county’s is only $8,000 . In 1994, the states of Texas, Maine and Vermont entered a compact allowing the disposal of low-level nuclear waste at a proposed Texas site. The compact demands both Maine and Vermont pay Texas $25 million to build a disposal facility. Prior to becoming law, the compact first needed to gain Congressional approval. Following its approval on September 20, 1998, the compact then required the state of Texas to license the project before moving forward . On October 22, 1998, Texas officials voted to deny the compact’s proposed site location following intense protests and organized opposition . Sierra Blanca already hosts Merco Joint Venture, the town’s largest employer shipping over 400,000 tons of New York City sludge daily to a nearby ranch. Furthermore, Sierra Blanca sits on top of an aquifer and is an active Earthquake area. Residents, environmentalists, and community groups have made numerous cries of “environmental racism”, even filing a suit under Title VI of the 1964 Civil Rights Act. Additionally, the site proposal created international issues with the Mexican government who held that it violates the La Paz Agreement of 1983, signed by both Mexico and the United States. This agreement states that both sides must work to “prevent, reduce, and eliminate any contaminating sources along the border zone extending sixty-four miles on either side of the border." Sierra Blanca is only sixteen miles from the Mexican border . The proposed site location in Sierra Blanca, recommended by Texas Low-Level Radioactive Waste Disposal Authority's (TLLRWDA), was originally chosen by the state agency because they expected little resistance given the high percentage of Hispanics and low income residents [1,2]. Similarly, many of the residents were Spanish speaking and did not have access to all of the information. Groups rallied together to form the Sierra Blanca Legal Defense Fund (SBLDF) in 1992. In the following years, there were protests in Austin, TX (where Governor George W Bush was who was a major supporter of the proposed site in Hudspeth County) as well as within Sierra Blanca and a petition was signed against disposal of the waste . Protests gained a lot of media attention and outraged Merco Joint Venture, the company TLLRWDA had contacted for the disposal of the waste. 1998 saw many protests, marches, and other forms of mobilization, especially on the side of Mexico. Following a shutdown of the Texas-Maine-Vermont compact by U.S. House of Representatives in 1997, Governor Bush made sure the compact was reintroduced and was successful in getting it passed later that same year. Several months before it was set to go before Congress, Mexico’s Green Ecologist Party announced a 24-day hunger strike which was spent on the bridge between Juarez, Mexico, and El Paso, Texas. They carried letters of protest from Mexican Congressmen, which pointed to the violation of the La Paz Treaty . In May 1998, Sierra Club activists met with a Vermont Representative trying to get him to denounce the bill and when that wasn’t successful, marched on Governor Bush’s home in protest of the bill with no response. 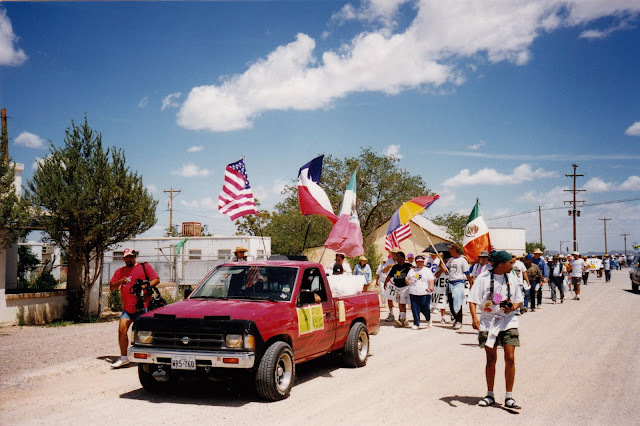 In July 1998, 300 Mexicans and Americans blockaded the Juarez-El Paso bridge. Protests were also staged at a nearby nuclear plant by the Citizen’s Awareness Center and the Nuclear Information and Resource Center. Unfortunately, all of these protests were not enough to stop the passing of the bill on September 20, 1998 . However, Texas officials denied the necessary licensing for the establishing of the proposed disposal site in Sierra Blanca as a result of the extreme social pressure that began by SBLDF and their partners. As a result, the project was officially shut down by the State of Texas on October 22, 1998 . While the fight was won in this town, the compact is law and these states will seek an alternative site [1, 2]. Project Details The site the TLLRWDA selected is a 16,000 acre ranch the state bought from private owners located just outside of Sierra Blanca. Sierra Blanca already hosts Merco Joint Venture, the town’s largest employer shipping over 400,000 tons of New York City sludge daily. Sierra Blanca is only 16 miles from the Mexican border. La Paz Agreement of 1983, signed by both Mexico and the United States., states that both sides must work to “prevent, reduce, and eliminate any contaminating sources along the border zone extending sixty-four miles on either side of the border." The waste may encompass reactor core control rods, resins, sludges, and piping that may include hazardous elements such as plutonium, iodine-129, nicle-59, and strontium-90. These radioactive isotopes would be hazardous for thousands, even millions of years . Governor George W Bush's support for the site made it difficult for community groups to respond, being outspent 1000 to 1 . Only 1% of Maine and Vermont populations and 37% of Texas' are people of color. Hudspeth County is 67% Hispanic . Grassroots organizations able to obtain 42 resolutions opposing the proposal on the local, state, and national levels in Mexico and the U.S.
Over 400 Mexican children participated in protests and marches. Development of Alternatives Waste Control Specialists proposed a disposal site in Andrews County, Texas as a less controversial alternative to Sierra Blanca. Why? Explain briefly. While the campaign successfully diverted the nuclear waste project, Texas continues to seek a disposal site and Sierra Blanca Legal Defense Fund has committed to fighting any site chosen in favor of more environmentally sound options. Texas dump might get other states' radioactive waste- Statesman.com May 2010. Regarding siting of low level radioactive nuclear waste dump in Andrews County, the alternative site proposed in 1998.